Cisco Systems is planning to release a larger and smaller version of its enterprise-centric Cius tablet in the new year, part of an ongoing push to get its Android-based tablet into the hands of more and varied enterprise customers. Cisco is best known for supplying communications and networking technology. Few consumers are even aware that the company has an Android tablet that was launched in August this year. And Cisco likes it that way. Cisco has spent much of the past year positioning Cius as a key component of its overall collaboration strategy, which the networking titan sees as a potential $42 billion opportunity for Cisco channel partners. But many Cisco solution providers see Cius as a question mark, and potentially unattractive, at a price point of $725 for a basic Wi-Fi-only version before volume discounts, when business users are adopting Apple’s iPad in droves. Cisco’s position is that it isn’t after all of the tablet customers so much as the right tablet customers: those that have Cisco-centric network infrastructure and are seeking, in Cisco’s eyes, an tablet with enterprise-grade security and collaboration capabilities. The Cius isn’t available in retail outlets and interested consumers will have to order it through Cisco business channels. Despite this drawback, businesses and enterprise owners have been steady in their support for the tablet. 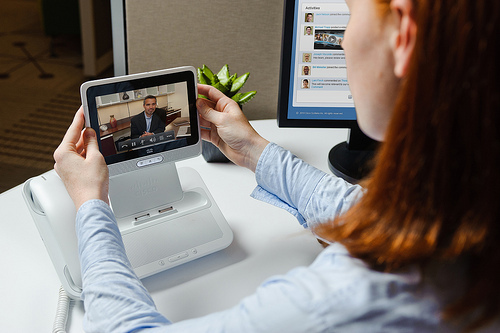 The current Cisco Cius, which is manufactured for Cisco by touchscreen device vendor OpenPeak, weighs 1.5 pounds and has a 7-inch VGA touch-target display, along with a front-mounted, 720p HD camera, a rear-facing 5-megapixel camera, and a range of other features. It’s heavily tied to Cisco infrastructure, including support by Cisco’s UC Manager and native support for Cisco collaboration products like Quad, Jabber and WebEx. One key feature is AppHQ, an application storefront, hosted in Cisco’s cloud, through which organizations can acquire apps that have been pre-validated to work with Cisco infrastructure, and also control what apps are made available to the users of their Cius fleets. The device currently runs version 2.2 of Google Android, also known as Froyo. Cisco opted to skip Android 3.0, or Honeycomb, to wait on Google’s release of Ice Cream Sandwich, or Android 4.0. The new tablets will also run on the latest Android software known as the Ice Cream Sandwich. Cisco is working on getting the Ice Cream Sandwich to the current Cius. The Cius has an Intel Atom processor, clocked to 1.6GHz. It also holds 32GB of storage and 720p videoconferencing capabilities. Global Cius availability for Cisco partners began July 31.